I'm traveling to Ohio this weekend, to celebrate both Mother's Day with my Mom and Grama, and my brother Mike's 30th Birthday (May 9th). So, this week's reference question is family-related. My sister announced in March that she's going to be having her third child, which got everyone excited. Her first two are boys (Andrew, 5, and Jake, 2), so needless to say she is really hoping for a girl this time. 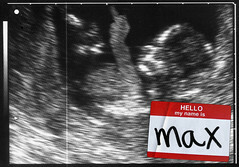 On Tuesday night she called to tell me that she is, indeed, having a girl. Hooray for Jenny. During the course of the call, we started talking about names for the baby, and she said she and her husband were having trouble picking a name this time. Jenny is usually up on what's trendy, and the names of my two nephews turned out to pretty much be the "in" names for the years they were born. But with this one, they're stuck. They didn't like the idea of looking at baby-name books (I don't know why), so I suggested some fun online tools. One, from the Social Security Administration, lists Popular Baby Names according to newborns registered for social security numbers. It shows which names were popular each year back to 1880, as well as allows searching by a name to see how popular it has been over time ("Brian" was #8 in 1974, but has since slipped to #63). There is also a by-state breakdown, to show which names are popular in different parts of the country. The second fun website I use for baby names is the NameVoyager Baby Name Wizard. It requires java, but is visually-appealing. Type in a name, and it shows a popularity graph (which indeed confirms that "Brian" peaked in the early '70s). Mousing-over the graph gives a ranking by year for the last couple years, then by decade for the '90s and back. What? Don't like my names? Try making up your own. I just learned this morning that Jason Lee named his son Pilot Inspektor. Huh.